« What to do in July in Oxfordshire in 2012? It is not quite north / south so forgive the creative licence. Demand for large family homes (over £2000 (b)) has been strong in Quarter 2 in Oxford, Abingdon and the south of Oxfordshire, but relatively weak in north and west Oxfordshire. The two factors at work are corporate tenancies and schools. The levels of incoming senior executives to north and west Oxfordshire has been limited, with few applicants having budgets beyond £1500. Whether by design or coincidence, stock levels at this rate have also been low. So while rents of larger properties are stable due to the fairly even balance of supply and demand, deal volumes are reduced and the top end of the market to the north and west lacks excitement. Further south in Oxford and Abingdon, the story is different. May and June have been peak months for letting unfurnished family houses to families moving to Oxford for September schooling and business leaders moving to the Science Parks inside and outside Oxford. The engineering, pharmaceutical and software clusters are key. ‘Science Vale’ is influential. It attracts excellent applicants from Europe and the Abingdon letting market has benefited. 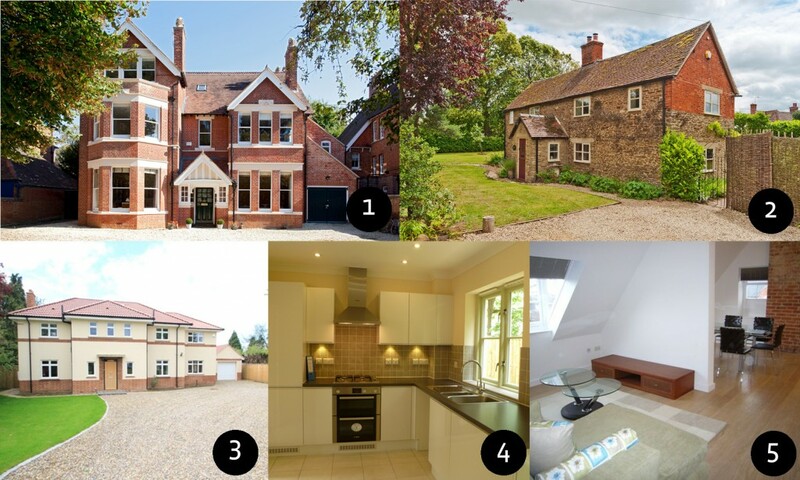 Some examples: four offers in 24 hours on one 6-bedroom Summertown home; a phenomenal 8-bedroom North Oxford home (Photo 1); a 4-bedroom East Oxford townhouse let to a family relocating from France; a gorgeous village home in Kingston Bagpuize, which starred in the film ‘Tortoise in Love’ (c), let on the first viewing at £2500 (Photo 2); a classic Picklers Hill property to rent in Abingdon let to arguably Oxford’s best source of corporate tenants at £2995 (Photo 3). The strongest demand across all areas is for smaller 1- and 2-bedroom properties. In Banbury people want to live in smart yet good value homes – described incisively by our office manager as ‘quality property cheap’ – in the town, and rents for 2-bedroom apartments have risen from £575 to £675 (d) in the last 12 months. The £700 mark may prove to be a psychological barrier. In Bicester demand for 2-bedroom houses is red hot and rents have gone from £775 to £825/850 in the past year. A similar trend is found in Witney where rents for 2-bedroom houses in the town have increased from £725 to £800 since June 2011. Village properties are not seeing the same rent increases. A perfect illustration of what tenants want right now is Photo 4, a new build, 2-bedroom house in the heart of Witney with parking and a nice garden. Five enquiries came in on the day of listing and it let immediately at £895 – stylish, central, private, new but still affordable. Renewals (people renewing their tenancy and staying put) have risen since the recession hit. Whenever we think the trend will subside, the figures tell us differently. Figure 1 is revealing. The forces driving this consistent increase are economic and employment uncertainty and a focus on the household bottom line. Figure 1 is important since more renewals means less rental stock available for new tenants and fewer property purchasers moving out of the rental sector. As we predicted (e), the new HMO regulations (f) immediately reduced the supply of property for ‘sharers’ as many owners did not want to pay for the licence or for the remedial renovations to gain a licence. This has had repercussions. First, good sharer homes with HMO licences are letting extremely well. For example, 3-bedroom apartments in Jericho are sought-after by postgraduates and let for £1495 to £1700. Second, many groups of 3 or 4 sharers have had to change their plans and live in groups of 2, which changes the dynamic of the 2-bedroom market. Photo 5 is a 2-bedroom apartment in Temple Cowley historically let to couples and now recently let to sharers. Third, these younger ‘sharers’ are precisely the younger tenants stuck in the ‘equity gap’ and unable to raise deposits to buy houses (g). The less funny irony is that by forcing sharers into smaller groups, the new HMO regulations are making them less able to save for a deposit – dividing council tax and utility bills (and food) by 2 people is more expensive than dividing by 3. Oxford’s universities remain popular. While applications to British universities fell 7.7% (h) this year against a record 2011 (see Figure 2), applications to Oxford University fell only 0.6% and rose 2.6% for Oxford Brookes University. This demand is mirrored in the private rental sector with our student business so far letting 96% of its property for September tenancies with an average 3% rent increase year-on-year. So while our cautious hypothesis from the last 18 months has been “students who have to find £9000 p.a. in tuition fees will have less money to spend on rent,” so far it is not supported. An anecdotal observation: Our market town offices have had more applicants in Quarter 2 who are setting up their own businesses, often as tradesmen and contractors and often as a reaction to redundancy. Our economy needs this endeavour but an unfortunate side-effect is that a tenant with no salary or self-employed earnings history is a high-risk proposition for a landlord. Paying in advance or getting a guarantor is a way around this. c We are proud to be a sponsor of this wonderful film. See their website for more details. f From February 2012, any property with 3+ non-related sharers requires an HMO licence which can then be controlled by new planning permission powers. No more HMO licences will be issued in East Oxford.